I saw this on the Scientific Seamstress’ blog this weekend and had to share it with you, dear readers. It’s so much fun to see what Carla has put into this. Carla, the blogger, is a molecular biologist turned patternmaker. 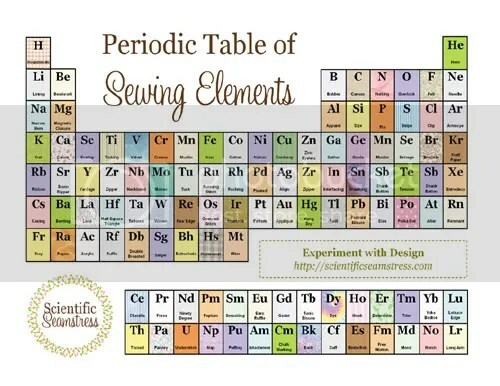 This Periodic Table of Sewing Elements goes with her re-decorated sewing room’s theme. She carried it wonderfully with beakers, botanical prints and giving her dressform a lab coat. Check it out on her blog post. It hasn't been this clean since this picture! 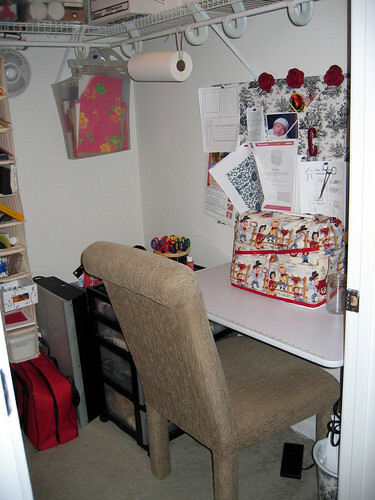 I’m coming up with theme of posts about our members’ sewing rooms soon, so maybe you’ll want to re-decorate so you can show off your sewing space on our blog. Does your sewing room have a theme? What word would you describe your sewing space? Leave a comment and tell us what your theme is! Put a link to pictures, if you have them posted. I’ll start, my space is called my Crafting Cave because it’s where I go to hibernate with my sewing, fiber arts and other creations.